Having been a longstanding fan of Eoin Colfer and his Artemis Fowl series I view the Lies of Locke Lamora as a "more adult" version of Artemis Fowl. Now that Eoin Colfer has finished the Artemis Fowl series, I'm ecstatic to have found a series that is just as intelligent, just as funny and jam-packed with action. 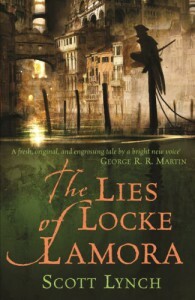 The Lies of Locke Lamora is a set in a fantasy world in a Venetian-esque city partly ruled by a Duke and the other part by several gangs united under one person (called a Capa). Locke Lamora is part of one such gang known as "The Gentleman Bastards", who con rather gullible rich people into giving up substantial amounts of money. Lynch's book documents the rather amusing (and sometimes sad) tale of how Locke Lamora's life goes to sh*t.
I really admire Lynch's style of writing - it's dense and poetic, but with a undeniable streak of humour. It's the layout of the book that really impressed me though; it brought me closer to the characters and strengthened the plot. Part of the book is set in the present, but each chapter ends with an interlude with a flashback to the Gentlemen Bastards' childhood. Lynch takes the reader right to the beginning of the characters' lives and weaves their past into the Gentlemen Bastards' present escapade. The plot itself is rather convoluted in places, which makes the book all the more exciting. Everything seems to go smoothly until about halfway through when all hell breaks loose. Like Brent Weeks, Lynch has the writers' philosophy of "I'm gonna put my characters through all manners of hell, laugh evilly, and see if they're smart enough to escape from my evil plot with their heads still intact! MWHAHAHAH"! And this is what really made me fall in love with this book - the sheer intelligence of Locke (and the author). In many books, the characters ameliorate their problems by the simple of use of braun or by just being annoyingly perfect (I'm thinking Rothfuss' Kvothe here). However, Locke's only weapon is his brain, and by the gods he wields it so damn well! It's easy to devour a book when you know the character cannot rely on the issues being magicked away, but only has himself to rely on. I've said a lot about how bloody amazing this book is and I've found it difficult to find any real flaws. There are a couple of things I was frustrated and saddened by. Lynch's world was previously occupied by a race of "people" called the Eldren who (probably) had advanced magical capabilities. Lynch barely touches on this aspect of the world, and I'm not sure if he will for this series anyway. Yes, this adds depth to the world and gives it a mysterious quality, but I want that mystery to be unveiled! I sincerely hope that the next book is as good as the first - I sometimes find that the second book just doesn't live up to the first. But despite my issues with good books, I'm really glad I've found a series that'll be worth waiting for.